Well, will you lookit that! I posted a proactive blog one day and the very next day I’m posting progress! 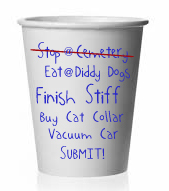 I can happily check “Stop @ Cemetery” off my Cup List. On my way home from Rockford yesterday, I slowed upon approach, flicked on my blinker, and pulled into the short drive of the nameless cemetery off Glidden Road just north of Baseline Road. Easy-peasy, absolutely no reasy for not having done it sooner. Upon closer inspection, I’m thinking it must be a Mary cemetery. Honestly, half the names on the markers were Mary. Husband of, child of; Mary. It seems to be a very old graveyard, but someone thinks it’s important enough to shore up a few old crumbling stones. And replace others completely. The newest headstone I saw, an obvious replacement, is engraved with the dates, 1827-1908 and 1842-1933. Then there was the marker I almost missed. Scrolling through my photos, you may have, too. It’s the tall one, in the middle of the yard, surrounded by growth. I imagine in summer it’s completely invisible. Color me curious. As I mentioned, I have driven past this plot easily ten times a week for about the last, oh, I don’t know, thirty years, and I have NEVER seen a person visiting. Until yesterday when the person was me. Kudos to the Cup List. This entry was posted in It's all about me and tagged Kudos to the Cup List., Mary Lamphere, Stop @ Cemetery. Bookmark the permalink.